Over the past year, I have been working hard on ending a terrible habit I have – biting my nails. I tried the bitter nail polishes and most of the products meant to help you quit the habit. None of them worked for me. While it was a major battle, I finally accomplished it. The problem was that my nails looked a bit sad from the abuse, leaving me looking for something to help fixed my poor damaged nails. About the time I started looking at different supplement, I was approached by NeoCell, who asked me to review some of their collagen products. Curious, I said yes, curious how collagen would be help me and if their products were worth the hype I had been hearing online. When I was first approached to do a review for NeoCell, I had no clue what collagen even was or why I should be taking it. I was surprised to learn that Collagen is one of the most abundant proteins in our body, helping strengthen your bones, muscle, skin, and even fingernails too. In other words, collagen is like the glue that helps hold everything together. Without it, you would have lifeless, saggy skin and ligaments and joints that didn't work properly. Recently, more doctors have been recommending collagen for those healing from muscle injuries, as well as for people who are worried about the aging process, especially if they are aging early due to skin exposure. Until recently, I didn't understand the importance of taking a collagen supplement. Heck, I didn't even know what collagen WAS, never mind that I should be taking it. What I did know was that I wanted beautiful, thick hair and stronger nails. For this reason, I was excited to start taking this supplement. I found that that after taking this supplement for a week my nails were much stronger and I had a nice, pretty shine to my hair. While I am still far from finishing this supplement, the Collagen Beauty Builder seem great for people who are trying to grow out their nails and hair! 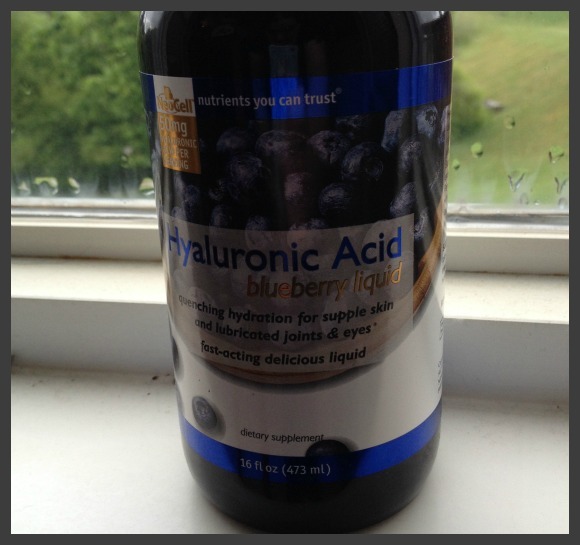 Being someone who loves blueberries, I was very curious to try NeoCell's Hyaluronic Acid Blueberry Liquid supplement. As many of you probably know, blueberries are a very healthy fruit. What I didn't know was that they contained hyaluronic acid, a compound that is fund in the joints to help with shock absorption and lubricating the joints. While this sounds all well and good, I was more interested in its ability to help with poor eyesight and dry eyes. Without my glasses or contacts, I am as blind as a bat! Any supplements that can improve my vision is always a plus! While I'm not sure if its helping with my vision or not, I can say that I have less issues with dry eyes. I don't know about you, but it's the most common issue I have as a contact wearer. I wear contacts that are meant to be worn for a month straight. Since I started using this supplements, I have had less trouble with my contacts drying out, even when I'm driving and having air blowing right in my face. The only downside is that this liquid is very sour, like blueberries that aren't completely ripe. I really can't taste the pomegranate or green tea that is also mixed with this liquid to make it even more of an antioxidant. 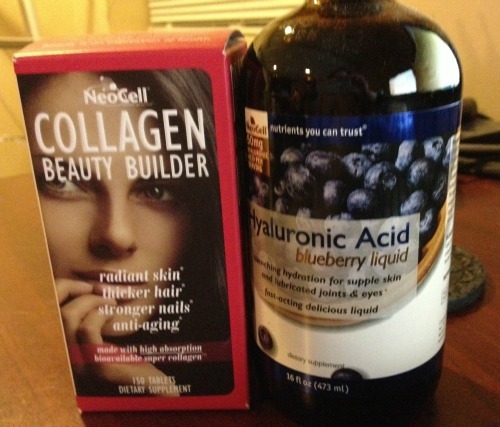 So far, I am a fan of NeoCell's Hyaluronic Acid Blueberry Liquid supplement. 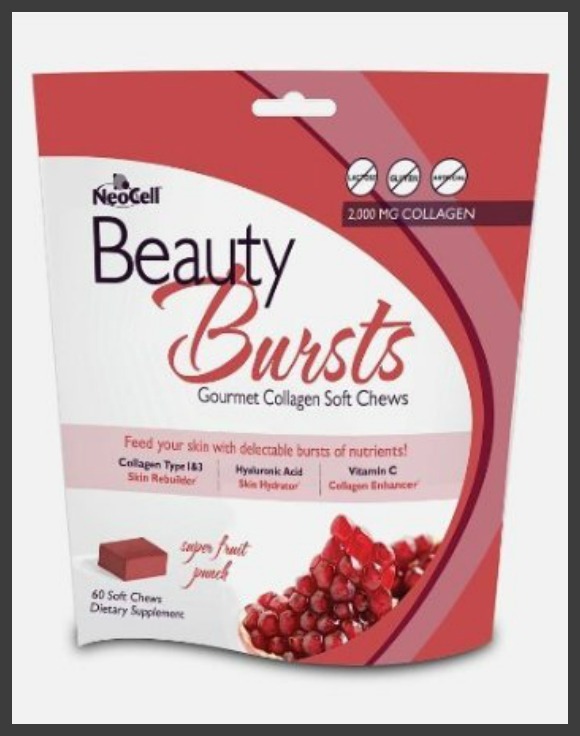 I'll be honest, I wasn't planning on reviewing NeoCell's Beauty Bursts. Last week, I was a bit late trying out some of the items in my Bulu Box from May or June. Inside, I found a collagen chew called Beauty Bursts. As someone who is always ready to try new things, I decided to give it a try. Oh my, these things tasted heavenly! Even better, I had so much energy after the second day that I felt ready to run a marathon (or at least go running with our puppy Reya). I was so sad when my two day sample was finished and went on Bulu to see if I could order more. To my surprise, they were a NeoCell product! I haven't decided if I am going to purchase more from Bulu at this point (after doing some more reviews, of course), or purchase them from Amazon. One thing is for certain, I NEED more of these! Based on my experience with NeoCells products, I have to say that I am very impressed. All of the products I have tried for this company have made me feel more confident about my body and provided me with even more energy. Best of all, my hair and nails look absolutely amazing! Based on my own experience, I give NeoCells products an A rating. They are fairly inexpensive, healthy, and great for just about every woman! Want to know where you can purchase these products? Currently, you purchase any of Neocells products at GNC, Whole Foods, or event Amazon.com. Personally, I would recommend purchasing their products from Amazon since they are not only cheaper, but can be shipped to your home for free. This is even more convenient for Amazon Prime members since you can get it shipped to you within two days for free, allowing you to shop from home without having to worry about crowds or dealing with snooty sales people. Since Amazon offers NeoCells products anywhere from 20% – 40% off regular price, why purchase them anywhere else? 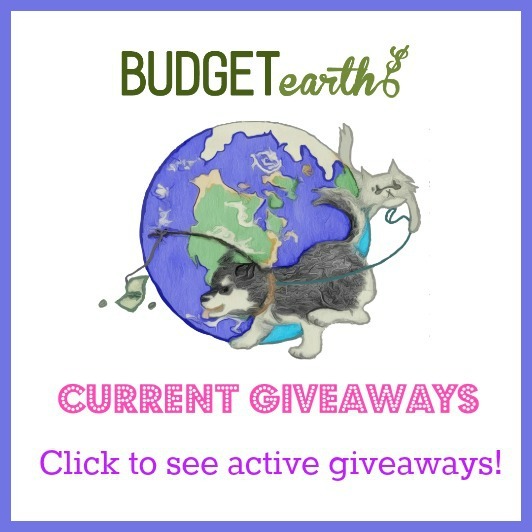 Disclosure: Budget Earth did not receive compensation for this review but did receive free products for review purposes via NeoCell . All opinions on this product are my own and may differ from our readers' opinions. I'd really like to try this. I need help with my hair and nails. As far as my skin goes, I'm no spring chicken! It's always a plus when a supplement tastes good. The chews sound good. Wow sounds like a very promising product My nails keep splitting and peeling no matter what I do . Lately I also noticed my hair falling out a lot more then usually not just when brushing. I have to stop vaccuum cleaning to clean the beater brush from all my hair wound around it. The shower stall is also clogged around the drain from my long hair. Thinking about cutting it short to avoid some of the tangles and also the weight might have something to do with it falling out more now in my old age. Id really like to try these products to see if there is an improvement. I would love to try both of these, but I am most interested in the collagen. I have some issues with dry skin and I have really big issue with my nails, they are paper thin and they bend while I'm doing everyday tasks. I would really like to find out if the collagen would help. I can't wait to try this! My nails are always weak even though I juice and eat organic. This could be the missing link! I've always thought of glucosamine as the joint supplement, but it's never done much for me. I broke my ankle pretty badly a couple of years ago, and it gets stiff and swollen — I'm always looking for a new natural remedy. I am very excited to learn about the Beauty Bursts -we have certainly come a long way with better ways to get what our bodies need! After reading your review, I am convinced this is what I need – collagen. My nails split and crack terribly, and I would love the added bonus of healthier hair! I am going to be doing a more thorough review of the beauty bursts next, as well as one of their hair care products. I am always frustrated with my nails so I’m super excited! Being someone struggling to make good of a head of rather fine, frizzy hair, along with brittle and usually weak fingernails, these products sounds incredibly promising. I'd already heard of the use of collagen for its anti-aging properties, but had no idea about these other benefits! I also have terrible vision, so blueberry liquid sounds great too! Thanks for the review! 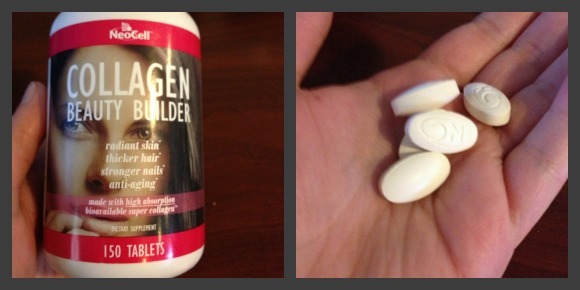 I have brittle and weak nails, I think Collagen Beauty Builder is just what the doctor ordered. After reading theis I wold also like to try the Beauty Burts, it sounds amazing. I would love something like this for my nails. They can get long, but they break kind of easily. I have never heard of this but very interested in it! I am always looking for things to help with looking and feeling great so I would love to give this a try! Reconfirming that collagen is one of the most abundant proteins in our body needed to assist in strengthening bones, muscle, skin, nails and hair has made me realize how much I would like to win this contest. Assisting me with my aches, pains and thin hair in addition to delaying wrinkles and sagging skin is a great reason for me to be entering this Contest for NeoCell. Please bring my "beauty builder" on! I am starting to show signs of wrinkles at 25 years old. My face is sad 🙁 My nails could also use help since they are so darn flimsy. I would be interested in trying some of these products. I would so much love to try this product as I am in my fifties with signs of sagging and wrinkles. Thanks for the great review on this product. I have got to buy this. I use topical hyaluronic acid to keep my skin in shape, but I didn't know you could ingest it as a supplement as well. I'll have to give this blueberry stuff a try to attack my aging on both fronts. I would love to try these. Anything that makes my hair and nails healthier sounds awesome! I have tried the beauty burst gourmet chews and they are so go!! Would love the opportunity to try the Hyaluronic Acid Blueberry. Thanks for the awesome giveaway! I would love to try supplements that would help my skin( wrinkles since I am 40, hair, and muscles. I would like to have more energy too! Collagen plumps up your skin and gives extra foundation for your nails and hair. I like that the Hylauronic Acid Blueberry Liquid by Neocell may help dry eyes. Wow, this is what I need to try. My nails are brittle, my skin has seen better days and my hair is just sad! I’ve looked into a couple products and this is sounding like the best deal. Thank you. These sound great! I'm always looking for something new to try. I need some collagen repair as I have become a middle aged women. Dry looking skin seems to be harder to get rid of. These sound like great products! I am aging and could use some help. Thanks for this review! I am really not a fan of pills but anything to improve my health and vitality is important to use. I am sure I would like the blueberry liquid as I like sour tasting things. I have never heard of this product until now. I really would like to try this I spent a little too much time in the sun and am starting to see spots. I would love to try this and see if there is any difference for me. I’m so glad you like my reviews! I am currently reviewing their chocolate mint chews and a hair health product now. You should see that review up soon too! These supplements look very useful. Thanks for the interesting and informative review! I would love to try the Hyaluronic Acid Blueberry Liquid. The fact that the hyaluronic acid helps our joints with shock absorption & lubrication is what appeal to me. I would also like to try the Beauty Bursts. Everyone I know talks about having little to no energy and I am no exception. I would love to have my energy level increased. Just think what we could accomplish if we all had energy!